What am I on about? A post on speciesm? Jurassic Park? Not the Momma? Don’t worry, I am fine. I just picked up the limited, commemorative celebatory special edition (etc.etc.) ‘Velociraptor’ avatar, available for free, till for SL12B! Even if you are not into raptors, dinosaurs or Second Life’s 12th anniversary, I say: go get it. It is free and it is fun! I have enjoyed and abused…err, used the previous editions a lot, I still do. Specially the first one, the Bear, is an old time favourite of mine. 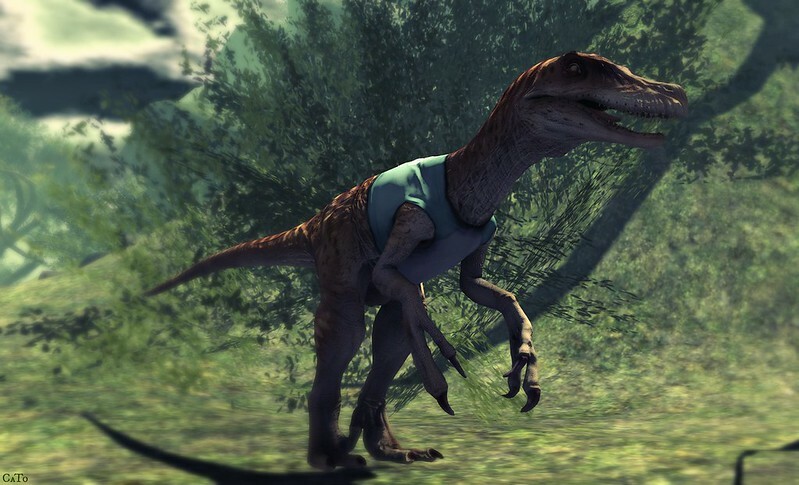 The Velociraptor comes dressed with a t-shirt and optional are sunglasses and a party hat. It also has a simple AO, to make it jump or lie down and lure to prey. Which I did and scared the crap out of some new residents..Hehehe. There is also an official photo contest, here all the details, for those who like contests and the chance to win some cash! Go pick up your free Raptor on Marketplace and have fun! Note: the blood drops in the last image are post processed extra’s and not part of the avatar! Note too: if you take pics of the raptor, feel free to add them in my Flickr Group for LL’s mesh avatar! Next Post Machinima, how about adding some life to your blog!